"When you go to your first MotoGP race and lead for six laps… 'Wow! Who is this guy?' - Herve Poncharal, Tech3. When Johann Zarco shot from fourth on the grid to lead after just a few corners of his very first MotoGP race, many had to pinch themselves to believe what they were seeing. But Zarco had fired the starting pistol on two 'incredible' seasons with Tech3 Yamaha, leading to a factory KTM deal for the Frenchman and factory KTM machinery for Tech3. That first lap in Qatar 2017 was impressive enough, but Zarco remained at the head of the field for lap, after lap - pursued by Honda's reigning champion Marc Marquez, then Ducati's eventual race winner Andrea Dovizioso. It would end in heartache when Zarco lost the front and fell on lap 7. But he shrugged off what might have been a crushing disappointment to take fifth next time in Argentina and Texas, then fourth - after battling for the lead - at Jerez, before a debut front row and podium at home in Le Mans. Two more rostrums followed later that season on his way to sixth and top satellite rider. Team-mate Jonas Folger also added to the Tech3 silverware at Sachsenring, before being sidelined by illness. 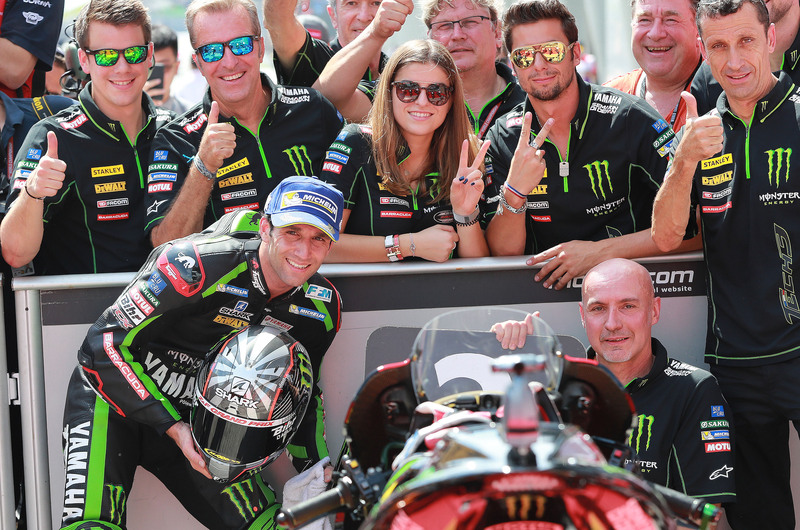 Tech3 had taken many MotoGP podiums before, but it was the unexpected nature of the 2017 success that stands out for team boss Herve Poncharal. Turned down by Suzuki in favour of Moto2 rival Alex Rins, Zarco had been picked up by Tech3 to ride alongside fellow rookie Folger. Although a double Moto2 champion critics said that, at 26, Zarco was too old to make a success of MotoGP while Folger had only been seventh best in the Moto2 standings. Mix their total lack of MotoGP experience with Tech3 being absent from the podium the previous season with Pol Espargaro and Bradley Smith, and few would have predicted what was to come. "Honestly, in 2017-18 we've lived through two incredible seasons. Maybe '17 more than '18," said Poncharal, during an exclusive interview with Crash.net. "Because what we did with the bikes during the previous two years with Brad and Pol was okay, average. But Johann - and Jonas until he left - were incredibly competitive. "They were two rookies from Moto2 and instantly felt good on the Yamaha. If I say 2017 was stronger than 2018 it's because it was a shock to everyone. Nobody was expecting it, so it's even bigger. By 2018 everybody knew. "So even though there were also some moments that were a bit more difficult, like the middle of 2017 and 2018, it was still two incredible years and we have to be very thankful." At his peak, Zarco appeared at the front of the field during all five races from Phillip Island 2017 to Austin 2018, missing out on what would have been a debut MotoGP victory for a satellite Yamaha rider by just 0.337s in Valencia and 0.251s in Argentina. In total, Zarco took six podiums, four pole positions, 14 front row starts and four fastest race laps with Tech3 Yamaha. Such success not only saw Zarco offered factory rides for 2019, eventually signing for KTM, but also helped secure Tech3's own move to the Austrian manufacturer. "When we look back, it's also clearly been two years that were very important for Tech3, because the profile of the team was raised," Poncharal said. "We were seen as a potential winner, quite often taking podiums, front rows, pole positions and fighting with all the top guys like Marc, Vale. "This is something you don’t do very often as a satellite team. Cal is doing it, but not so many riders can. So these last two years are something we are very proud of and I think it also helped us to finalise the deal with KTM and Red Bull." Hafizh Syahrin will remain at Tech3 for the new KTM era, with Moto2 title contender Miguel Oliveira taking over from Zarco, who was again sixth and top satellite rider in the 2018 championship.